is Rosie's theme for us. Want to play along? This month is all about celebrating things associated with spring! From butterflies to rainy days and flowers, this is the month to smile, relax and have fun. Yeah, we know it’s not spring where everyone is, but this is also a theme about the spirit of celebrating rebirth, renewal and rejuvenation. And please as always : Don't forget to take a look at our RULES . We are looking forward to seeing with what you will come up! Für März haben wir die liebe Rosie von Rosie's Bastelwelt als unsere Gastgeberin. >>> FRÜHLING <<< ist Rosie's Thema für uns. Willst du mitmachen ? In diesem Monat dreht sich alles darum, Dinge zu feiern, die mit dem Frühling assoziiert werden! Von Schmetterlingen bis hin zu Regentagen und Blumen ist dies der Monat, in dem Du lächeln, entspannen und Spaß haben kannst. Ja, wir wissen, dass es nicht überall Frühling ist, aber das ist ja auch ein Thema über den Geist der Wiedergeburt, Erneuerung und Verjüngung. Wir freuen uns schon auf Eure Beiträge und bitte beachtet wie immer auch die Regeln . Wonderful Journal page and Lovely theme for this month Rosie! Thank you for inspiration. Its a beautiful spring page Rosie and I love this new theme. Love this Rosie... Your page is fantastic!!! Thank you, Coco. The challenge runs the whole month. It would be great if you hava a little time to play with us. Beautiful Rosie, hope to play along this time! 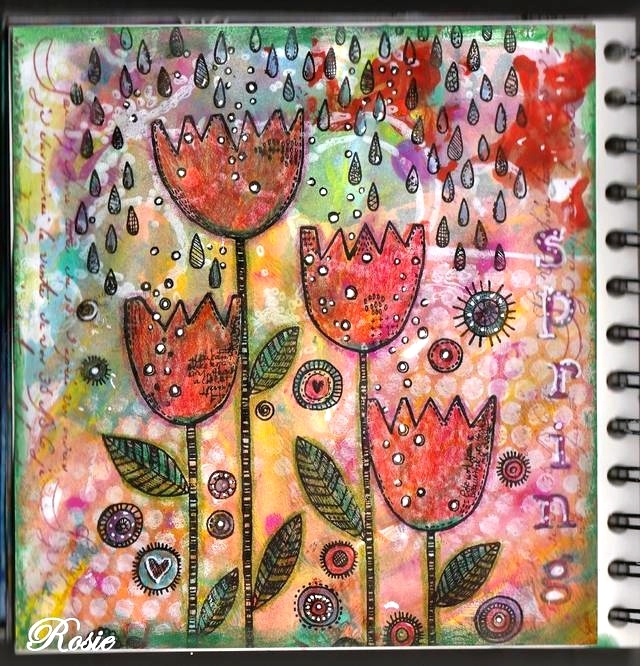 what a gorgeous journal page- so cheerful and I love all the mark making!